Indium Corporation will feature its new solder paste, Indium10.1, at the Surface Mount Technology Association’s International Conference and Exhibition (SMTAi) from Sept. 28-Oct. 2 in Rosemont, IL. Indium10.1 is a Pb-free halogen-containing solder paste with the lowest levels of voiding for QFNs, BGAs, and pads with large ground planes. The oxidation-inhibiting properties of Indium10.1 provide industry-leading head-in-pillow and graping resistance, with complete coalescence, even after long reflow profiles. Indium10.1’s exceptional soldering ability makes it the best solution for components with less-than-ideal solderability and challenging RF shield metallizations. Indium10.1 offers the lowest cost of ownership to PCB assembly manufacturers through best-in-class printing and soldering performance, including industry-leading print definition and transfer efficiency, low voiding performance, and head-in-pillow and graping resistance. Indium Corporation will be exhibiting at booth 430. 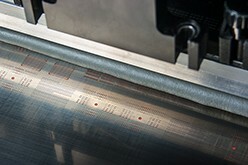 For more information about Indium10.1 or the Pb-free Solder Paste series, visit www.indium.com/solder-paste-and-powders/leading-pb-free-solder-pastes/ or email askus@indium.com.